Does Lemonade Grow On Trees? What is LemonAID for Trees? LemonAID for Trees is a student-run lemonade sale benefiting Trees for Houston! This is a school-wide community service project where all grade levels at The Fay School can participate! Each year, Fay students fill up their pitchers and head out to their sidewalks to raise funds to help Houston stay green. 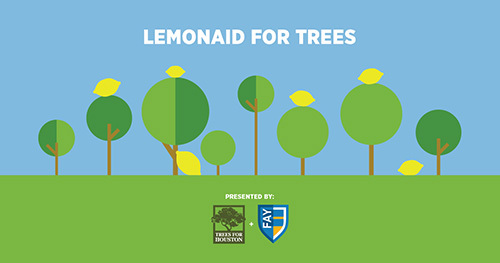 Supporting Trees for Houston, LemonAID for Trees helps Fay students build confidence, entrepreneurial skills, and foster the spirit of community service. Whether your Fay student sets up shop in your front yard or collaborates with their classmates to sell tasty beverages at a local park or public space, LemonAID for Trees is a fun opportunity for our Fay Families to live our core values through community service. Demonstrate Fay’s core values in Action! Entrepreneurship: Business owners must be prepared to be successful. From gathering supplies for their product to producing, packaging, marketing and selling their goods and services. Goal Setting: Operating a lemonade stand as part of a school-wide initiative show’s students how to set and achieve a personal selling goals while working with their classmates to reach a larger, collaborative goal. Math: Understanding your finances is a critical component in business leadership and in adult life. A lemonade stand is a powerful incubator for young tycoons, giving them a crash course in business math. Outdoor Education: In a very tangible way, LemonAID for Trees directly supports Fay’s Outdoor Education curriculum and our habitat! Community Service: There is a big world outside of Fay’s campus. Contributing to the financial needs of a community organization, like Trees for Houston, makes green spaces possible for other people. Clear Communication: Students must take ownership of how they interact with others, from the illustrations on their lemonade stand sign to their dialogue with customers, with the confidence to talk about the project as they operate their stand. Confidence and Interpersonal Skills: In order to sell a glass of lemonade, you need to be able to hold a conversation. Students learn how to confidently engage with customers and communicate the project while building rapport with people in their community. We look forward to hearing your experiences with our Fay students’ lemonade stands through Houston!